A supply teacher at school once taught me to tilt my paper - I think I was about 8. All teachers were fine with this, except another horrible supply teacher on my first day in a new schools who said'we don't have our paper like that in this school'. I had very neat writing at school - so they probably saw it worked well! After writing a long paper, the whole side of my hand will be completely blackened from the lead I smeared with it. Also digging hole in paper with pen tip! Always, all the teachers comment that my hand writing needs to be neater. As a left hander I am unable to use fountain pens as I find that due to the shape of the nib the pen "drags" into the paper. As you can tell by my age, when I went to school the teachers tried to make me write right-handed, so I never developed pretty handwriting, but I had a big resentment against my teachers. At school I was informed that I was a very lucky girl, because I was one of the first children the British Army schools were allowing to use their left hand. Before I started school my Mum taught me to tilt my paper, so that when I was writing I wouldn't hook my hand or smudge my writing. But when I went to school the teachers seemed to have a problem with anyone left handed and wouldn't let me tilt my paper (they would paperclip it to the table so I couldn't move it! ), thus I now write with a hook and smudge my writing. Being condemned by teachers for my "messy" cursive when young and for writing with my left hand. They were right handed and did not know how to teach a left handed person to use handwriting. I had this same issue with my 10 year old just this past school year. So I had to get the teaching material and teach him myself. Bios are the worst for writing with. The heat of my hand smudges anything I write with them. But I did learn from an early age that if you write with a piece of paper under your hand that you don't smudge your work when writing with a messy biro or fountain pen! California State University, Sacramento has removed a large majority of their left-handed lecture desks. Since a majority of classes are large lecture type, I have has very bad back and neck problems. The chairs are permanent, and I cannot add another desk because it would be a fire hazard in the walkway. Catholic Schools, some seemed disappointed that I could not write legibly, however no effort was made to assist in writing left handed. Depends on pen used. I could get neater script with fountain pens than with biros but often I had to concentrate. Edward is developing a very bad pencil grip and bad posture. Both his father and I (his mother)are right-handed so teaching him good habits is difficult as we really don't know how it feels to hold the pencil in the way he does. Edward's sister is also left-handed and has developed bad habits too. We have tried to address these but have had very little support from the school. Erasable pen is the worst for smudging! Erm... I'm always smudging everything I write. Especially with pens and mechanical pencils. I also arch my hand weirdly, and I take a lot of room to write. Especially as I used a fountain pen at school. especially when using fountain pens! Even though I am now at university, I suffer terribly with the speed in which I write, which has affected me throughout my school life and was never picked up until I informed one of my former teachers. Every day when I get home from school, the side of my left hand is blue from the smudges off my page! Every time I take a test that uses a bubble sheet, I have to go back with an eraser to erase smudges that were caused by my hand. I usually try to take the test backwards. Everybody say that I have a very nice handwriting...if I actually draw letters. Exams caused a really aching left hand. Also I now have a callous on my middle finger and one on my little finger from it smudging along the page. found if I held the pen pencil on an angle don't get aching hand or smudging. still sometimes get print if doing the newspaper crossword all along little finger and side of hand. Had to use a line guide at school that was on a set place on the table - couldn't twist it around so ended up with very sloped writing! Handwriting is'normal' but un-decipherable now due to being used to typing into a computer. Handwriting kept me off the Honour Role quite a bit. Have to twist body to accommodate everyone else when on table. At UNi chairs ONLY have table on right arm NOT helpful for left handers! I actually don't write with an odd grip like the other left handers I know. I have a very upright grip with very little paper slant needed-although I do sometimes grip the pencil too hard. I also have a tumour in my left should which makes things extra fun. i always end up arching my hand above the paper as opposed to resting my hand on it - it hurts! I always get ink or graphite on the side of my hand when I write. I always had smudges on my hand from writing and usually I'll have to redo what I'm doing. For example writing in a card, on an application, I hate having the smudges. I write pretty fast though because my teachers will talk fast and I like getting things done. I always try to avoid writing in pen because of the smudges. I am a left handed teacher, teaching textiles in a secondary school. Thought I'd fill it in from the staff's point of view. I am a teacher, and if I need to handwrite a sign, I work right-left, bottom-top in order not to smudge my work. Clever, but hard! I really feel for left-handed pupils. For all children, their day they first write with a pen should be a great achievement. For left-handers it's the start of blowing on your writing to help it to dry! I am a very positive person but have MS and my right hand side is affected. I am retired and am only just able to sign my name with my right hand. I spend quite a lot time painting in oils and acrylics but it is now almost impossible with my right hand and so I am now beginning to paint with my left hand. Do you have anything OI can use to improve the pointing of my brushes in my left hand. I am now going over to my left hand for most things. I am answering some of the questions regarding myself as a child, and other questions I am answering as a left handed elementary school teacher who is proud to be left handed and makes it very special for my left handed students! I am no longer a student but can answer these for when I was a student, It was terrible. I am RS hemiplegic, we believe I should be RH, but have to use my left hand due to disability. I can write quickly but my handwriting is illegible to everybody else. I can't write with pens unless they are the ballpoint kind that dries as soon as it touches the paper. If I write with any other type of pen it's impossible to read what I wrote. I constantly smudge the work I've just written, leaving my writing looking sloppy. I generally have to use a second piece of paper to follow my hand to avoid smudging. I did have trouble learning to write certain letters. I did the national handwriting competition at junior school and was always determined to write well - my brother (10 years older) was made to write right handed without my parents knowledge so they were also very supportive of me. I do occasionally smudge my work, but not often and I don't write with my hand hooked over the page. I don't think this is solely due to being lefthanded. My hand aches when I do a lot of calligraphy. I entered school in the time when children were changed to writing with their "right" hand, but I was lucky, and no one ever tried to change me. I feel that is why I have no problems writing today. I experienced all of these symptoms frequently. I find it easier to print than to write cursively. I find that I grip the pen quite hard and this makes my hand ache. I had a grade 2 teacher who helped me a great deal in proper positioning of my paper and hand in writing. She was left-handed herself and I had no trouble after that. I had a teacher in 2nd grade that tried to get me to change hands because my paper being turned the wrong way messed up her perfect rows. I had a third grade teacher who showed me the correct way for a lefty to hold their paper. I had problems in primary school, repeatedly getting detention for bad handwriting. Surprisingly my teach was also left handed. It was just before secondary school when someone suggesting tilting the page and I have had no problems since! I had to angle my page at school to prevent my work smudging, this would drive the teachers crazy! Schools are somewhat more tolerant now, but it still becomes a problem with a righty and a lefty sitting side by side. I hate smudging my work. Not only does it ruin the quality of the finished piece but also leaves my hands a mess! i hate the fact that after writing with pencil and even some pens the side of my hand is covered in led or ink. I have 2left handed children and 2 right handed children. 1 of the children writes painfully slow and the other writes with a pencil into adulthood because of the smudging and his writing is chicken scratch. I have a 6 year old boy, who after starting kindergarten last fall, I am more aware of his problems writing left handed. I am filling this survey out on his behalf. I have always had problems with writing, esp when at school, I like my paper wonky and we had to write with it straight, so I always looked like I had really fast writing coz it was smudged. I also still find joined up writing hard, and will only join up a few letters even now. I have always had a particular problem with smudging. I now primarily use pencils instead of pens to do my work, since lead is much easier to wash off of my hand/erase from the page. I have been writing and taking notes for the better part of 15 years, and my 8-year-old brother has nice penmanship. I have filled in this survey on behalf of my 10 year old son who is left handed and dyslexic. i have grown into a habit of curving my hand around the top of my page to avoid smudging, something which the majority of my teachers frown upon. I have never mastered the art of fountain pen use! I have the odd callus bump on my left middle finger from writing incorrectly all my life. I have to use pens or my writing is too smudged for my "happiness." I pride myself on my good handwriting. I HAVE VERY BAD UPPER BACK PAIN ON MY LEDFT HAND SIDE COULD THIS BE DUE TO MY WRITING? I just had to answer these questions to get them off my chest. I realize you were going after school children's current problems. I never associated "writer's cramp" with being left-handed. I always thought it was just because I did a lot of writing. I prefer to use a slim pen with a fine point tip that has a quick drying ink. After years of smudging this prevented a lot of smudging situations. I remember the psychopathic teachers in grade school would have me write with my right hand and then make me feel stupid because I couldn't do it. I remember when learning cursive, my teacher got a red pen and told me that all my letters "slanted" the wrong way. She drew red lines across the paper indicating which way they SHOULD slant. When I said that I was left handed, she said "Oh, then this is fine." How do you bring a marked up piece of paper home and say that you did well on it? I seem to grip pens and pencils too hard which makes my fingers and hand ache. I seem to grip the writing instrument very tightly and press hard on the paper. My hand ached/aches on the back on the fleshy bit between the thumb and first finger. I smudge my writing a lot, even when writing with ballpoint pens (I often come out of lectures and exams with a large patch of ink on the side of my hand) and find my hand aches if I have to write quickly or for long periods of time. I smudged my work constantly in grade school and would get scolded for it. I get hand cramps sometimes too. I sometimes smudge my writing, and my hand used to ache until my art teacher showed me how to correctly position my hand. I started out in Junior School smudging my work but eventually I learnt to stop smudging! I still smudge work - I take minutes in meetings and my hand always has a blue smudge mark down it. I do get an aching hand but just thought that was'normal'. I write quite quickly and people are quite amazed how neat my writing is for a lefty ! I always get asked to do the writing but don't do'joined up writing', sometimes it is joined a bit but most of the time the letters are close together. i turn my paper so its horizontal to write to prevent smudging. I use to write slower but now I can write as fast as anyone else but mostly only I can read it. I used to get a sore red mark from writing when I was younger as the pencil dust would irritate my hand where it rubbed along the page. I used to have a lot of problems with smudging my writing until I learned a way to write and not smudge my writing. I also found that (compared to other kids my age) I wrote a lot slower. I used to smudge my work but over the years I have learnt to position my hand and my pen in such a way that this no longer happens. I used to smudge my writing all of the time when I was younger. Eventually, I taught myself how to write so that I wouldn't smudge anything. I used to tilt the page upside down to write. It looked very odd to others but it stopped the smudging...sadly not the cramps in the hand. I usually get lead all over my hand when I write. I volunteer in a second-grade classroom and sometimes I'm required to write on the board--it's horrible! The first time, everything I wrote would get erased...very frustrating. I was afraid to write in pen at school, for fear of smudging work and being labeled'messy,' so for years I only wrote in pencil! I was allowed to find my own comfort zone, but expected to conform to standards. I was never corrected to write with my paper slanted to the right. I just observed the right-handed children and copied them with their papers slanted to the left. I'm proud to be left-handed but I wish I didn't have to curve my hand inward in order to write. I was permitted by all of my teachers to tilt my writing paper - or rather, I wasn't prevented from doing it. My biggest problem was with the issue of creating "finger spaces". A right-handed person puts their left index finger next to the last word they wrote and then writes their next word. I, on the other hand, had to REACH over my right index finger and then rest my left arm on my right hand to put in the next word. A TOTAL NIGHTMARE!! Even now, sometimes if I am not concentrating I will write my words too close to each other. I was the last person in junior school to get a handwriting pen as I continually smudged my writing. I was held up as an example of a messy writer to my classmates. Charming. I was told by my english teacher, a day before my english exam "have you ever thought about being taught to write again"
I was very lucky in elementary school. My teacher was always forcing me to write left-handed properly--completely breaking the bad habits my kindergarten teacher had pushed into me. If I started hooking my hand, she'd come and correct my hand and paper position. If I tried to switch to my right hand to be more comfortable in those hideous long desks with about ten kids on each side, she'd yank it out of my hand and put it into my left until I did it properly. I wasn't taught how to properly grip a pencil. Causes aches in hand when writing extended passages. i work in a school and I find it hard to mark children's writing or write in comments as the pen smudges my writing! I write in the normal way, only left handedly. I have to peer over the top of my hand to see what I am writing, but I have never wanted to turn my paper. I write slower than my friends. I write with my paper at an almost 90 degree angle! i get pains all the time when I am writing which stops me writing neat. I'd rather be typing than writing. I'm helping my son with this survey who is 13 years old and is left-handed. I'm in college and some of the classrooms have only little wooden right-handed desks. When I have to take a lot of notes or write essays on exams, I often leave with a sore neck and back from having to twist in my desk to reach the writing surface. I'm much better with typing! I'm now working on my second Masters' Degree. Writing has always been a very slow process, and having to take copious amounts of notes during lectures is really difficult. in elementary school, we wrote with pencils. I was often going to the lavatory just to was the lead residue from my hand from dragging it across what I had printed. My shirt sleeves would get dirty as well. In the 1950's it was almost considered to be a crime in the school I went to to be left handed - teachers tried to make me change. In the days I was in school Teachers had little or no idea of the problems experienced by `lefties' I recall being put on the `bottom' table due to me writing backwards!! It is a torture to write in ink, in liquid ink,above all. If I have to make a cheque , I write and blow to dry the ink. It was the same at school, when I had to draw. It is really annoying when I am writing - particular with fountain pens - and I start the next line and the previous line is all smudged and with fountain pen, it stays on my hand so when I continue to write, the whole paper is smudged!! it was hard to learn to write since my family is right-handed. my mother couldn't teach me how to properly hold a pencil, so I have a bump on my ring finger from pressing on it with the pencil. its annoy because all the pens I used are BIC pens, and they are fairly comfy but my writing is just smudged. It's hard to write if you hide your writing as you move on. i've been told by many that I have extremely messy cursive, but people love my print. maybe it's the left hand curve? Jose Mauricio gets tired easily when he does his homework specially when he has to colour or practice the writing of the vowels, however he enjoys drawing pictures of landscapes and members of the family. Just to let you know, I am a left-handed teacher. My responses will reflect what happened to me in school and how I run my current classroom. Learning Gregg Shorthand and making the speed tests were most difficult for me, I did finally complete the tests with much sweat and tears. Left-handed chequebooks were brilliant! Thanks to Nat West for that. Legibility is a big problem for me when trying to write quickly. This is largely due to being coerced into writing with my right hand when I started school. Luckily I write without a hook and fairly easily although it has taken time to get rid of smudging. My 4 year old daughter is left handed. I had to take information into her nursery to ensure she was taught correctly from the start.She is about to enter school and I am very aware that I need to pass on my knowledge to the teachers in order for them to support her learning. My answers are based on long ago school experience! I had terrible handwriting until about 8th grade: always got poor grades in it. my artwork frequently gets smudged because I draw and paint with my left hand. My first grade teacher was an enlightened individual. I was especially blessed because she never allowed my difference to colour my relationship with righties. My handwriting has always been pretty bad, especially when I was young and writing with pencil. I'd smudge everything and end up with a black hand. It's all right now with pen, but I had to find the right pen for me. Fountain pens leave me with blots and smudges all over the place, but ball-point pens work just fine. Had to work this out on my own of course. My penmanship has always been great! My wrist is curved while I write, if I write a lot, it tends to get sore. My outer palm tends to cramp as well. My writing is very legible and precise. Never had any constructive help with how to write as a left hander, just told a lot of the time that I must improve it! Did this myself by trial and error by about the age of 14 and was largely successful by tilting the page. No trouble at for I don't write like most left handers. I am told I have good penmanship for a guy. Not to the point it would stop me. I would say I'm quite persistent (sp). Not very neat or easy to read ! Now at Sixth form college 3 hour essay writing exams can be hard but are getting easier! Now, with quick-drying pens, life is easier, but writing with pencils is still difficult. on plain paper, used to end up with tapering margins! Once I turned the paper sideways, the smudging stopped. only in primary school, I think you taught me to write underneath the writing when I was about 11/12. Only used to smudge occasionally with fountain pen --- but then everyone seemed to. pens don't dry fast enough for me and my writing ends up all smudged. Really it depends on the pen that I use. There is this one kind of pen that I will definitely smudge. Many people still tease me about my handwriting. Right-handed writers would/could get an aching hand, too. Since my writing had a tendency to smudge, I completed school papers in ink or ball-pen, so answers needed to be right the first time. Smudging is normally only with pencil, since I press hard when I write, and with markers. The worst is when I write on dry erase boards. smudging occasionally, but nothing major. smudging, and'clumsy' notebook bindings make it hard to write. Smudging and spiral notebooks caused the most problems. Pens were not as good then and I always had ink on my hands. Sometimes I smudged my work depending on how I tilt the paper, or if there was somebody sitting next to me preventing me from doing so. Still quite slow developing skills for writing. Lack of support for left hand in school and to development of gross motor being a contributor. Teachers used to encourage me to turn my paper for an easier time writing lefty. THis was the opposite of what I needed. The attempts I made to change my writing-hand for the right one have been enormous. But I never wrote with my right hand longer than one day. The biggest problem I had was with a teacher turning my book so the lines ran horizontally while I was in primary school. The entire side of my left hand is covered in ink when I write in pen. The main problem that I have is smudging everything that I write, it's the reason that I stopped writing in pencil. I try to only use pens with fast drying ink. The outside edge of my left hand and pinkie finger always look dirty. the problem with the smudging is mostly with sketching in art so my art teacher suggested sketching upside down and that worked better. since primary school I now have a indent in my middle finger on my left hand just behind the nail because of where the pens sit in my hand. The smudging is almost never a problem now, unless I'm using a sub-quality pen. Once I got the hang of writing properly, the aching hand was no longer an issue--I don't know how she did it, but my right-handed mother taught me how to hold a pen and pencil normally so that I don't have the hook style that so many lefties do. When we were learning cursive in elementary school, I wrote slowly to try to force my letters to conform to the style we were being taught. In later grades, when we were allowed to have our own writing style, my speed picked up since I was free to form the letters in a manner that worked better for me. The smudging would be on my hand and not so much the paper. The wire of my wire-bound note book was always digging into my wrist... especially when using a student desk designed for right-handed students, forcing me to suspend my left arm in the air when writing long essays. Arrr! There really needs to be a non-smearing pencil lead. That would make my life so much easier. There's not enough time during timed-math and timed-spelling tests because he writes slowly. They tried to make us right handed back then. 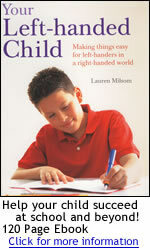 This all depends on the attitude taken by parents of left-handed children and not making them feel different. I was quite old when I realised that I used a different hand as it was never an issue at home or at school although there were no other left-handed people/children in the home. This was especially a problem in fourth and fifth grade when we were required to write with fountain or cartridge pens. this was only a problem when I was younger, as I have now managed to find a way that works for me. Those rings in notebooks always poke my wrist and it hurts. unless I write very slow, my writing is very bad! until I figured out to turn the page round slightly !! Very messy writing generally, because of poor technique! Was not allowed to use my left hand to write with at school. Was wrapped on the knuckles if I did. I now have very bad hand writing and it is still a very unnatural thing to do. We have some primary schools where the use of fountain pens is compulsory. Thankfully mine wasn't one of those because my "experiments" with my dad's pens went horribly wrong. All my work would be smudged and if my shirt was long-sleeved I would have a lot of explaining to do with ink all over the sleeves. We use to write with ink pens and I would be the only one with smudged work. Went to Catholic school in Brooklyn, NY, at 5 yrs. old. My left hand was hit every time I tried to use it, then I had to sit on my hand. I was pulled around by my hair for being EVIL, (lefty)! Ignorance taught at school, imagine that! When I first started writing and scribbling the way kids do, I wrote from right to left - it was easier that way! When I first started writing/printing, I tilted my paper the right handed way and wrote slanting to the right. When I got to junior high, I started tilting the other way and write backhanded. No more smudging. When I was in elementary school my left hand would be covered in pencil lead from all the smudges. I also got it all over my white uniform shirt. When I was in school smudging my work was a constant problem. when I was younger it was common for me to end up smudging my work and coming home with my hand very grey and shiny from all of the pencil lead on it. when my mom realized she was raising a southpaw she bought me a big chalkboard so I would learn to write with my hand under my work. But I still smudge occasionally. When using a rollerball type pen,I must wait till it dries to continue writing (such as filling out pay stubs or making lists). I ALWAYS have a smudge down the whole side of my left hand whenever writing. When writing with a pen the ink is smudging, and if I put my hand in a position that I don't "slide" over the ink I'm getting an aching hand. wipe boards are a particular problem as rub it off as I write!! With a pencil, I would end up with black all over my little finger and edge of my palm. I would also have difficulty with wirebound tablets and 3-ring notebook binders. Often I would write on the "reverse" side of the page (holes to the right) so I would not have to twist my wrist around or arch my shoulder. Some teachers were not happy with this, but I told them it was the "correct side of the page for me". Writing is horrible with erasable pens and sometimes pencils if you write for a long time. Yep, I always end up with a blackened pinky because it runs over the lead.